Practices, talks, tools, and techniques to help us work with the symptoms of stress and trauma. 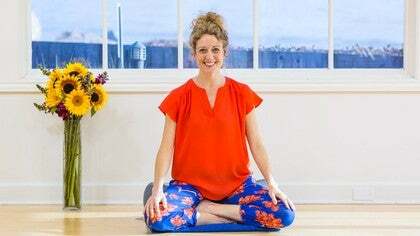 In Season 1, Kyra shares talks, practices, and techniques to find center, ease, and calm, while helping to dispel trauma and stress from the body. Kyra welcomes us to Season 1, where she will share practical practices, tools, and techniques to help us with the symptoms of trauma and stress. Kyra offers a talk on stress and trauma, and its impact on the body. Yoga invites us into a healing relationship with ourselves. In Season 2, Kyra offers healing practices and tools that will help safely and skillfully work with symptoms of trauma and stress in both the body and mind. In Season 2, we continue to explore practices and tools that will help safely and skillfully work with symptoms of trauma and stress. Kyra offers a talk on interoception—what is it and how a trauma-informed yoga practice can fine tune the system. Identify toxic shame, an aspect of trauma that impacts our psyche, and how yoga can remind us of our own divine light in this talk with Kyra Haglund.